Most stock yacht buyers don’t want the challenge of reefing and playing with sail combinations when they drop the mooring lines for a day’s sail. That anyway, was how Pittwater boat building brothers, Carl and Paul Hutton, saw the requirements of the market when they decided to produce a small stock yacht suitable for far sailing on Australia’s east coast. They have been proved correct in their observations as the yacht they developed, the Hutton 24, has proved to be a top seller in areas such as Pittwater and Sydney Harbour. The Hutton 24, in an attractive package, provides low cost yachting in a small, beamy keel yacht that is able to make offshore coastal passages. The package isn’t a new idea when you look back at other successful small yachts such as the Endeavour 24 and Hood 23, but where the Hutton win in being about as big inside as many 26 footers. The Hutton is basically a good heavy-weather sailing boat and that in a nutshell, is the reason she won over many new boat buyers who had otherwise been looking at other stock keelers and at large trailer sailers. The Hutton, during an early winter test on Pittwater, showed she is a remarkably stable boat that can carry her standard working rig of full mainsail and Number Two Genoa in winds up to 30 knots. She doesn’t need reefing as early as do many other small yachts and she handles well when weather chops up rough, both good reasons why many cruising minded sailors have bought her. Developed from a number quarter-ton designs, the Hutton 24 no slouch as a club racing yacht and many people have bought her just for this reason. Styling of the Hutton is more big ­yacht-like than some other new yachts around her size and no doubt many buyers have been won over by her generous bow and stern overhangs. The bow is well raked and, compared with many new yachts, the Hutton has a distinctive appearance with lots of tumblehome in the topsides and full aft sections that flow into a neat, wide reverse transom. The hull shape is not only distinctive but is also quite effective, particularly in fast running and reaching condi­tions when the wide buoyant aft Sec­tions allow the Hutton to slide along very quickly and without fuss. The low-slung buoyancy of the Hut­ton is matched by a fairly high ballast-to-displacement ratio that could possibly do with more sail power if optimum racing performance was the criterion – which isn’t the case in a good stock cruiser/racer. I was able to judge the boat’s ability in fresh conditions with a westerly of 15 to 20 knots. In these conditions we were able to carry the standard rig and handle the conditions comfortably. In these conditions our crew of four only got the lee deck wet when we pur­posely held the bow off when sailing upwind through a hard gust. The Hutton’s ability to stand up to her sail and move smoothly through the occasional stretches of choppy water was impressive. On a close reach she moved particularly fast with her wide stern sections keeping the quarter wave well aft. One got the impression­ that in these conditions she could have been pushed hard under spinnaker and never look like round­ing up. In the lulls the Hutton gave the im­pression that she would need a good-sized Number One genoa on light days, but then that would be the beginning of the road to race perfor­mance which, so far, most Hutton owners don’t seem to care for. The Hutton is not a high topsided boat but within the limits of 1 .53m (5ft un) headroom, and without aid of a poptop, she is very roomy. The tumblehome adds to the interior cabin space and, with a maximum beam of 2.7m, that falls about half height on the topside, the Hutton brothers have been able to open out the interior. Basically a simple plan is used, providing six berths, a galley unit and an enclosed WC. The layout can be adjusted to suit each owner because all the bunk units are modular and are not part of one big internal moulding. The boats had been built with a full timber interior fit-out before the boat we tested but Hutton’s then intro­duced fibreglass bunk bases to match the fibreglass galley unit and fibreglass deck-head lining. Privacy in the cabin can be achieved by adding a curtain or screen between the fore-cabin and the rest of the sa­loon. A half-width bulkhead fills in the port area between hull and the timber compression post that takes the weight of the deck-stepped mast. The cabin styling approaches that of the popular wedge but still does not cut out the sitting headroom in the fore cabin, or over the head. While headroom keeps most adults to a stooped position when moving around below, I did not find the cabin uncomfortable for it. As one could guess many owners have ordered the optional poptop which springs the headroom around the galley area from 1.53m to 1.89. In our test boat there was one quar­ter berth and two saloon settee berths as well as a big double berth in the fore cabin. In latter boats buyers can have two quarter berths, if they want it, with provision for outboard stow­age in either quarter berth. There is a sink and stove in the galley unit but no icebox is fitted, space being left to stow a portable Esky under the com­panionway steps. The Huttons didn’t think that an athwartships dinette would help the layout so they designed a saloon table that can accept six adults when it is up. The table in our test boat worked well without filling the cabin as some do. The only thing I didn’t like was the way this particular table had worked loose on its pedestal mount, tending swing around at will. The table is removable and stowed up the quarter berths. The berths are all wide which is not good for offshore sleeping but just great for sleeping when at anchor. The interior was attractively finished off with timber trim and varnished panelling though there were a few rough spots in the lockers formed by the berths – this will disappear with the use of fibreglass bunk units. I particularly liked the use of woven fabrics on the bunk cushions, the clean fibreglass head liner and tinted Perspex in the long cabin windows. The main feature is the large, deep self-draining cockpit which takes four or five adults. There are no cockpit lockers for stowage though the Huttons intend to add one small locker for deck gear. The cockpit has a bridgedeck with the mainsheet traveller mounted where the helmsman can work the mainsheet and the headsail sheets, if he requires. I usually don’t like tillers that grow our of the cockpit floor but in the de­sign of the Hutton the positioning of the spade rudder would have reduced the cockpit area if the tiller had not been allowed to come from the deck. On our test boat the tiller had not been properly pegged and it tended to drop below hand level when you let it go-Carl Hutton assured me that most of the teak tillers are better behaved. The side decks are a bit narrow which is, I guess, the compromise side of having a bigger cabin. You can ac­cept a narrow side deck as long as you have hand rails on the cabin top or life rails to grab. The Hutton doesn’t come with hand rails on the cabin top, which is a mark against it, and one I would be rectifying early if I owned one of the type. The Hutton comes simply but adequately rigged for leisure sailing in standard sail-away form and includes a rig made up by the builders – they are also good spar manufacturers as well as stock yacht builders. Our test boat had the main halyard led aft to the cockpit so you could eas­ily slab reef the main. The headsails are beefed up on a small winch on the mast. With the standard sails one can handle a 40 knot blow by slab reefing the main and headsail, both of which come standard with the slab reefing fitted. Stock sails are by Hood sails while the sheet winches in the cockpit are by Barlow. The Hutton’s construction is not going to let the boat down. The bottom area is laid up to 30 oz while the builders pay particular attention to fib­reglass bonding the hull-to-deck joint from the inside as well as using an alloy toe rail to mechanically bond the joint. All the deck areas are reinforced with Airex foam and the deck and hull both feel solid. The keel is a lead-filled cast metal unit that bolts onto the hull, while the rudder is a hefty stainless steel spade that is made up together with the rud­der stock. As for auxiliary power, the builders recommend around six to eight hp outboards. An optional outboard bracket mounts on the transom. The Hutton 24 is sold complete and in two more basic stages. Stage one is a basic assembly which has the boat in the water with the keel and rudder fitted but no interior fit-out for $6380 (May 1978). Stage two is sail-away which includes a basic interior fit-out and the boat rigged and ready to sail (main and Number Two genoa). 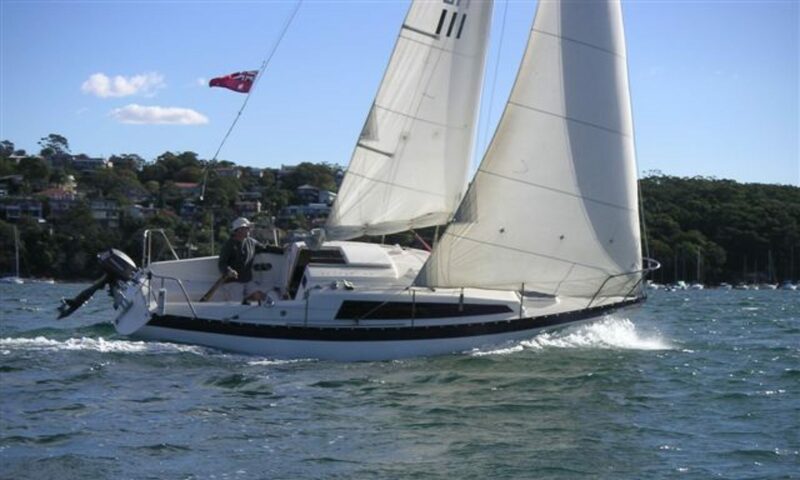 Sail-away does not include the pop-top, bunk cushions, WC and other interior comforts but it does get the buyer sail­ing very inexpensively for $8950. With all the “goodies” onboard -bunk cushions, head, stove, lights, timber trim and life rails-the buyer is up for around $11,000. With extra sails and instruments the price could be as high as $13,000 but as Carl Hutton says, most people today are not load­ing so much money into their yachts as they did in the past but keeping things comfortable but simple”. 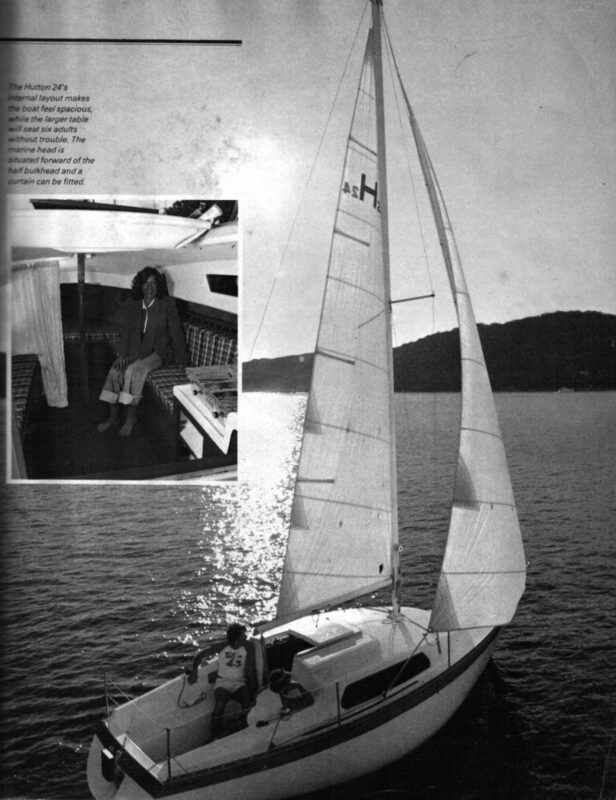 A swing-keel version and a motor sailer model were being planned at the time Seacraft tested the 24.